Army wives (in fact, all military spouses) face very specific challenges. No one can help negociate these like fellow spouses. 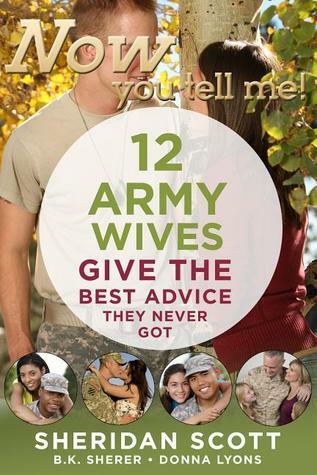 In this very helpful and practical book, wives of many kinds of Army soldiers weigh in on what they wish they’d known. BETH CHIARELLI: When my husband Pete took the “Vice” job (Vice Chief of Staff of the Army), my kids asked me how many times we had moved. I counted up, and this was our twenty-ninth house! Over the years, I changed my approach to unpacking. Usually, you’re tempted to do the kitchen first, and everything else later. After about ten years, I started doing my bedroom first, because every day you wake up and it’s nice. You don’t feel so defeated when you wake up. I can’t say I did that every time, but the times I did, I really liked it. When we moved to Gelnhausen, Germany, it was total chaos. We’d been given a house, but at the last minute, they made a decision to let the Command Sargeant Major move onto post. They literally gave him our house as were were on the plane flying over. When we arrived, there was nothing they could do but put us in temporary quarters, where we stayed from August to the end of October. I had to leave my kids playing with people we had just met so I could go house hunting. These people were fine, but I wasn’t. It was so stressful. Then one day I came back to discover that my son had fallen out of a swing and had broken both of his arms. There he was in Frankfurt with the batallion commander’s wife, and these huge plaster casts, and Pete had to take off for a training exercise in Grafenwoehr, Germany. I didn’t have my European driver’s licesence yet–and then I found out I was having a baby. Could it get any crazier? I always tell the younger wives, when you look back, you will not believe what you did. You just will not believe it. But the thing is, you are in a culture, the Army culture, where other people are doing the same stuff all the time. When you try to tell your civilian friends, they are just horrified. They think it’s crazy, and maybe it is. I think some women have the expectation that their husbands’ jobs and promotions will supply something they’re lacking in themselves. As I described it during a talk to a group of young women, “Every time I move away, I find myself again.” You are who you are. Your personality is going to stay the same. So if you have an expectation that somehow your husband’s job, or the house or the quarters that you get will make you somehow different, it’s not that way. At the end of the day, it’s still you making decisions. Whatever the situation, give it your best shot. You can find something wrong with any situation. There will always be some issue to face. Sometimes you have to decide what your own happiness is going to be. It doesn’t matter if you are military or civilian; there will be some hard times. Probably the worst thing for me was having to tell our son who was going to be a high school senior that he had to move. But we had made the decision as a family that we weren’t going to split up. Some families, for the sake of their kids’ potential college careers, left them behind when they moved. For some that worked out great, others not. But still, you have to follow your gut for your own family. Make your decisions, and live with them. My first experience as an Army spouse was when my husband Charles had just finished basic training and Advanced Infantry Training (AIT) at Fort Benning, Georgia, and our duty station was Fort Stewart, Georgia. I’d been on post at Fort Bragg many times.This, however, was my first time shopping ant the commissary and Post Exchange (PX) as a wife and mother. We had a sponsor who welcomed us and showed us around. Usually assigned by the commander, sponsors are people who are usually of equal rank and have already been in the unit for a while, so they’re able to help new families get settled quickly. I learned where all the important facilities were, such as the gas station, hospital, the commissary and the PX. (The commissary sells grocery items and the exchanges carry consumer goods.) I learned the hard way that you need to present a military member ID card or military family member ID card when entering or paying for goods. I remember feeling like everyone else was moving at the spped of light handling their business, and I was the only person who didn’t really know how to do things. People weren’t very friendly or willing to help the newbie figure things out. Maybe that’s how it seemed; I was eighteen and pregnant, and facing new challenges every day. I felt overwhelmed and very much out of the loop. Over time I learned the ropes, and it’s become easier. However, I kept that memory; through the years, it helped me become willing to stop and help young wives who looked completely at sea. New families entering the military have so many resources available to them. More so than when I was a young military spouse. Take advantage of those resources and educate yourself about military customs and traditions. The military language is a beast to tackle, but if you arm yourself with the basics it helps you better understand what’s going on, and also helps you get through Army life. The Army Community Service (ACS) program is a great way for young military spouses to learn Army language and lots more. There are different levels of training that help with rank recognition, acronymns, and even military protocol. [As does this book!] You can also learn it online now–isn’t technology grand? The truth is, it’s an ongoing life course. My husband is in the Army for twenty-seven years now, and I’m still learning things. When your husband talks to you about his job, show interest! It’s important for him and important for you. I can guarantee you that along the way you will be asked about your husband’s unit, know as a Military Occupation Specialty (MOS). I’ve run into wives who have no clue! It’s his profession, and a good part of your life, so at least be informed about what’s going on. Perhaps the most important thing to do–as soon as possible after arrival–is to make friends with a spouse in the unit, or even a neighbor who has an outlook and interests similar to yours. Realize that gossip can and will be abundant. Steer clear! Nothing good ever comes from it. The best advice I can give to families new to the military is that being flexible is key. Things change constantly and the more you fight it, the harder it will be to have a positive attitude. The military does not have a conspiracy to ruin your life or to make it difficult. The Army tries really hard to make military life more enjoyable, steadily improving the quality of life for everyone. Through all these deployments, I’ve learned that you can choose to be miserable or be happy. I choose to be happy, and I work at having goals to get me through. Durning Charles’ deployment when we were in Fort Carson, Colorado, a good friend and my “battle buddy” helped us keep our bodies strong by setting goals. Our group had two large goals. The first was to hike up Pike’s Peak, which, at 14,110 feet, was quite an accomplishment. At the time, I was a full-time student, bogged down with a heavy study load. Because of this, I never completed that goal and regret it to this day. i was at least able to do several shorter hikes, and the social time along with the workout turned out to be a very important part of the process. Our second goal was to run a half-marathon. I did complete that goal and have the medal to prove it. Our group trained together, and those are some wonderful memories of a time when my life was difficult. Army wives stick together, and decades later, those friendships are still strong and growing. Click here to biuy the book and KEEP READING much more insider advice from Beth, Frances and others!